IET is a UK based international Institute. IET OnCampus CUI Abbottabad Network is one of the Student Network in Pakistan working in collaboration with IET UK. The IET is one of the world’s largest engineering institutions with over 168,000 members in 150 countries. It is also the most multidisciplinary – to reflect the increasingly diverse nature of engineering in the 21st century. 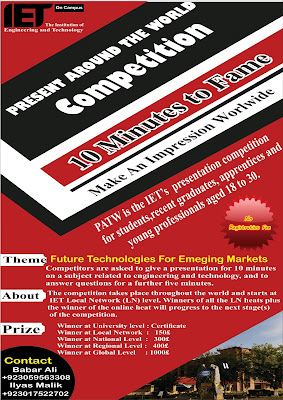 PATW is the IET’s presentation competition for students,recent graduates, apprentices and young professionals aged 18 to 30. Competitors are asked to give a presentation for 10 minutes on a subject related to engineering and technology, and to answer questions for a further five minutes. The competition takes place throughout the world and starts at IET Local Network (LN) level. Winners of all the LN heats plus the winner of the online heat will progress to the next stage(s) of the competition.